After a tough winter for the environment at Riverside, The Friends of Historic Riverside Cemetery (FHRC) is pleased to support the “Replanting Riverside” initiative undertaken by Fairmount Heritage Foundation and the Colorado Association of Lawn Care Professionals (see the press release below for more information). 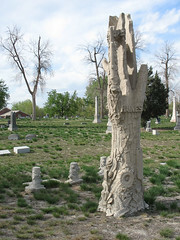 The Friends of Historic Riverside Cemetery is committed to increasing awareness and encouraging preservation of Denver’s oldest cemetery. We believe that this program is a very valuable preliminary step in the process of revitalizing Riverside. The process of weeding and replanting Riverside’s 77 acres of landscape will require a great deal of time, energy, and expertise, and will take many years. Doc-A-Block: because of their age and fragile condition, many of the monuments at Riverside are in danger of being lost forever. The purpose of the FHRC Assess-A-Block program is twofold: first, to develop comprehensive documentation of all the monuments and features of Riverside, and second, to develop priorities for restoration and preservation. With the work that Fairmount is beginning to pursue to restore the environment, plus the two initiatives being undertaken by the FHRC, we are hopeful that this signals a welcome rebirth in interest in commitment to the long-term well-being of Riverside. For more information on the Friends of Historic Riverside Cemetery, please contact us via email at friends@friendsofriversidecemetery.org. Fairmount Heritage Foundation can be reached through their website. On Earth Day, April 22nd, beginning at 8:00 a.m., dozens of lawn and landscape experts from throughout the state—headed by the Colorado Association of Lawn Care Professionals (CALCP) – are volunteering their time, materials and equipment to “replant Riverside”. April 22 (Earth Day) — Planting and “testing” various types of native grasses in various plots in order to find out what kinds of plant life will thrive in Riverside’s soil. The plantings will include ground cover, native perennials and native grasses. (May 23rd) An Eagle Scout will coordinate more than 30 volunteers including other Eagle Scouts and Boy Scouts to pull weeds remove dead shrubs and clean-up the entire fence line surrounding riverside Cemetery. Boy Scout Adopt-a-Block. Boys Scout Packs, Troops and Crews have adopted blocks at Riverside Cemetery to assist with the revitalization plan. Cutting weeds, mulching trees and shrubs etc. Following the efforts of CALCP, the Fairmount Heritage Foundation will continue with several other community groups to revitalize Riverside Cemetery throughout the summer. Colorado Association of Lawn Care Professionals. Front Range Community College’s Ray Daugherty, Professor of Horticulture and Landscape Technologies. The International Society of Arboriculture. Eagle Scouts and Boy Scouts from throughout the metro area. Donors of materials and seed include Pawnee Buttes Seed, Sharp Brothers Seed, High Country Gardeners, Western Native Seed, Beauty Beyond Belief, John Deere Landscapes, Chem Way, Alpha Once Inc., Helena Chemical Co.
Workers and equipment are being donated by Davey Tree Expert Company, Whit Tree Service, Jim’s Pride Landscaping, Cyn Mar, Fertek, Van Diest Supply, Bestyard.com, Green Mountain Lawn and Tree Care, Lawn Doctor.